Hey students, how much do you love cats? If you do, this EXCLUSIVE job offer will get you more than excited. 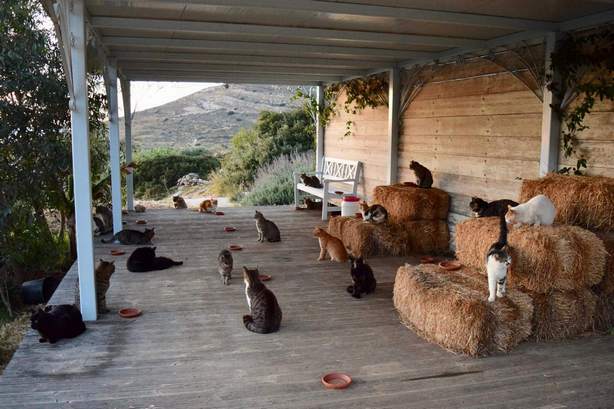 Just imagine living in a cat sanctuary on an exotic Greek island of Syros! There are 55 cats, though, that will need your attention daily. The Typical Student team previously explored your employment options as a Fortnite Tutor for Up to $50 Per Hour. Now, there’s something more! Is This Job Offer for REAL? If you think you’re well-trained to be a cat sitter having two or three cats at home, think twice! The main job requirement is dealing with a gang of 55 cats! At God's Little People Cat Rescue, you’ll have to feed the cats, clean up after them, and give each of them medication. No need to pay rent or bills. And the BEST part of it is of course living on a picturesque Greek island of Syros! The cat sanctuary founder, Joan Bowell, moved from Denmark to Greece for health reasons. Together with her husband, she has been managing the cat sanctuary for 8 years, but now she is moving on. How Much Does Cat Sitter Earn? Granted all of the future employee’s expenses are paid by the organization, they will earn £320 ($408) monthly wages, according to the Mirror. There is a 2-4 week volunteering trial period and minimum of 6 month required long-term employment. To read more of the employment conditions and apply for the job, go to God’s Little People Cat Rescue Facebook page. Feel free to send your CVs to joanbowell [at] yahoo.com. The chosen applicant will begin their duties at the sanctuary starting November, 1 2018! BEST Summer Jobs Guide for US Students 2018: How to Become a Lifeguard in 30 Hours!